freelancing technology tutorials How to approve UpWork Account in only one hour? How to approve UpWork Account in only one hour? To approve upwork account/profile is very easy task now. 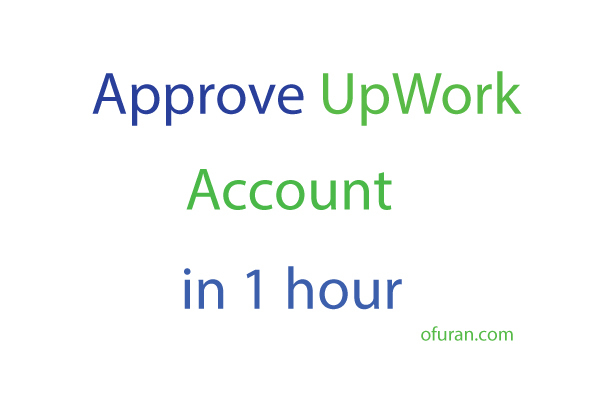 Please follow the following steps to get fully approved upwork account in only one hour. It may seem unbelievable after approving your upwork account. Let's start now. There are 12 categories and some subcategories under these categories in upwork. Please look at a glance here. See How to get First Job on Upwork very Easily? The most common subcategories that the freelancers use are Web Development, All design and creative, Animation, Audio production, Graphic Design, Illustration, Logo Design and Branding, Photography, Video Production, Data entry, Admin support, Virtual/Personal Assistant, All writing, Article, Blog writing, Academic Research, web content, other writings, editing and proofreading, SEO, Lead Generation, Optimization, Marketing, translation etc. These sub-categories are used more in freelancers profile. There are a lot of freelancers profile under above sub-categories, but not available so much jobs for these profiles. So Upwork decided to not approve if someone create account under above sub-categories. It is really pathetic but true. So, we have a plan. If you approve your account with other subcategories, no matter if you do not know those works, just put those other sub-categories into your upwork account and submit for review. I am sure that your account will be approve in only one hour. Then remove those subcategories from your account and decorate your profile as you wish. It is really an amazing way to approve upwork account now. I have a suggestion for you that which subcategories you have to use that you have to face no problem to approve in only one hour. Please use the following subcategories and make a unique title for your account. Desktop software, Game Development, Software development, Database administration, 3D Modeling, Architecture etc. But be serious to add these subcategories that upwork authority do not think that you are using fraud technique. Add only few subcategories and some skills on that subcategories. Thanks a lot for reading, if you are benefited by our writings, nor forget to comment below.